Eating even moderate amounts of canned soup significantly increases exposure to Bisphenol-A according to a new study published Tuesday in the Journal of the American Medical Association (JAMA). The chemical BPA, suspected of causing damage to human health, is used in the interior lining of the vast majority of canned soups and vegetables. For the study, researchers at the Harvard School of Public Health fed fresh soup made without any canned ingredients to a group of students and staff for five days in a row, and fed 12 ounces of canned soup to a second group for the same five days. Researchers measured BPA urine concentrations in both groups, then after a two-day cleansing period, switched groups, feeding the canned soup to those who previously received the fresh soup, and vice versa. 75 volunteers participated in the small study. The results show that after consuming one can of soup per day for five days, BPA urine concentrations were approximately 13 times higher on average than after consuming non-canned soup. A similar study published two years ago, also led by Jenny Carwile at the Harvard School of Public Health, found a 69% increase in BPA urine concentrations among Harvard students assigned with using polycarbonate plastic water bottles for one week. Although BPA leaches into food and drink at room temperature, the higher rates found in canned soups and vegetables has to do with how they're manufactured, says Frederick vom Saal, Professor of Biological Sciences at the University of Missouri-Columbia. "Canned vegetable products are all coated with BPA and they're sterilized in the can for hours at very high heat," explains vom Saal, "the problem is that BPA is heat sensitive in terms of breaking the bonds apart in the resin lining and releasing BPA into food." A separate study release last month found a greater risk of behavioral issues like hyperactivity, anxiety, and depression among the daughters of mothers with elevated concentrations of BPA in their urine during pregnancy. Still, that study shows a correlation, not causation. John Rost of The North American Metal Packaging Alliance, which represents the canned foods industry, says the elevated BPA levels following consumption of canned soups only shows that people are well suited to metabolize the chemical, and get rid of it in urine. Vom Saal points out that many chemicals leave the system at similar rates as BPA, but are able to greatly alter physiology – an example he gave was birth control pills that also are excreted in urine. "In order for it to be in urine, it has to have gone through blood," explains vom Saal. "And when we look at serum levels of BPA in people we find free BPA in blood, and so have over a dozen other studies." So its passed in the urine. What is BPA doing to my cells while on its way to my bladder? this chemical was removed tfrom drink bottles after being deemed unsafe. So why is it so safe in our canned soups? Something smells fishy here & its not the clamchowder! Well, no. It was removed from drink bottles because people stopped buying them without any actual proof of harm. The solution is to either grow your own or buy fresh or frozen to make your meals with. It's obvious this guy could care less for peoples health. I've already made up my mind to discontinue the purchase of canned soups, and I suggest others do the same also. Lack of info............what are the concentrations detected, and are they physiologically relevant? Yes, I noted they walk all the way around several important facts without actually stating them. most countries who care about their people have out lawed BPA. talk about a RED FLAG. The government is wondering WHY There is a revolt in this country. Wake up people they don't want us healthy either. There is no "revolt" in this country. Go have a look at Egypt if you want to see what a revolt actually looks like. Comparing tiny street protests in the US to the actual revolts sweeping through the Middle East, with citizens actually putting their lives on the line to have their say, is insulting to those efforts and ludicrous. Jooyce, stop hyperventilating. You might be revolting; you don't speak for others. I myself am quite attractive. I think the "revolt" you're talking about has more to do with "health" than Egypt. You are right about most countries having outlawed BPA. They must have had a good reason for doing so. The US should follow suit. Even China and Malaysia... Come on. Excellent point. And can someone tell me what exactly is the FDA doing about this? Perhaps one of you nay sayers could derive an alternate substance and save all mankind . . . what? After the next bong hit? OK I'll wait . . .
Maybe we could use your keen skills in the area of negitivity to help us! For all food that is not highly acidic (basically all types of beans), the answer is: oleoresinous c-enamel. This technology is already used by Eden Organic, but it costs more per can than BPA lining. Thanks, dc. I'll check into Eden Organic. I wish the article was more descriptive regarding the "liner." I know the white lining has BPA and I avoid canned corn and such as a result but my soups look like just tin. 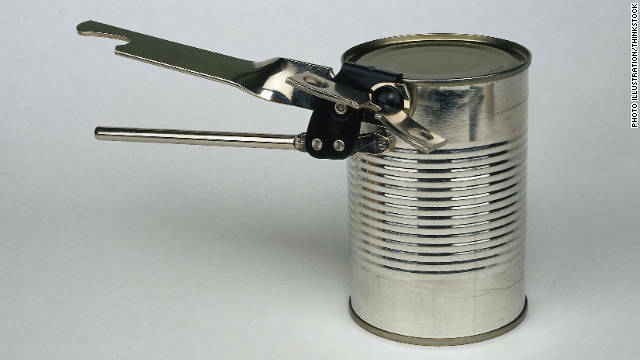 I do not want BPA in my chickpeas, pinto beans, tomato sauce, Amy's soups, anchovies, olives, pumpkin puree...looks like it is time to throw away the can opener. Uggh, more work in the kitchen. Try to convince them to remove it. I never eat canned soups anymore mostly because of the msg in it which makes me very ill..this just gives me one more good reason not to eat it and to make my own! MSG is a neutral substance meant to enhance the flavor of food, it does not react in your body. your reaction to MSG is Psychosymptomatic...(its in your head). there is MSG in alot of foods that you don't know about, yet your just fine. Actually, reactions to MSG are quite well known. The FDA recognizes it as "generally safe" however due to the number of people who have reactions and thus the controversy surrounding use of MSG in products, all products are required to have a label stating that MSG is present. A reaction to MSG is not psychosymptomatic. I'm just gonna start eating dirt. Switzerland initiated a study of BPA about 15 years ago. They determined that there was a relationship between BPA and increases in hyperactivity. Beause Switzerland is in the EU all other countries were required to ban its use. The results are still under study and nothing is scientificly proven. Switzerland is in Europe, you're right but it's not in the European Union (EU) which means they can please their littleselves in all matters of governance. Some european countries have banned BPA but only in foodstuff containers for children under 3 and in baby bottles. Lol liked rick woffords the best! Hasnt bpa been in items such as cans since cans became? Werent we all raised with canned foods? I dont remember everyone being hyperactive anxiously awaiting depression lol.. Bunch of silliness. BPA has not been in cans for long. The epoxy resin process using phthalates was only patented in the late 1970's, and did not become widely used in the industry until the late 90's. Before that, canned foods had a shorter 'quality' shelf life because the metal in the cans often caused a metallic taste over long periods of time. By the way canned food is safe to eat just about forever if it's not dented and stored reasonably well, it just tastes off if it's stored too long. Ask yourself which do you prefer; having to use your canned goods in six months instead of 28 to ensure quality, or having a hormone-like chemical with lots of suspected, but few proven, health effects leech into your canned good during processing, but allowing the food to sit much longer on shelves before its used? Now replace the 'use' in the above sentence and pretend you are a food manufacturer – with the plastic epoxy coating you can run 1/4 the number of production cycles per year and have the cans sit in your warehouses for four times as long before they have to move to market. You save on factory overhead by calling in workers much less often, and can still keep up with demand. Is it any wonder why the canners refuse to investigate the health risks? Is it any wonder why they resist an investment in switching to bioplastic resins in the coatings instead of synthetic plastics(BPA), which remove the metallic taste just as well but cost a bit more and would cause canned foods to have a slightly shorter shelf life? We as consumers don't have a right to tell anybody how to pkg their Soup provided it does no harm. If it harms humans, then the government steps in. If you honestly feel that bpa plastics are going to harm you...don't eat canned soup. Processors will soon change change the way pkg the stuff. Yet I wouldn't be surprised if bpa plastics lined tanks weren't used in food prep upstream of the canning process. Oh well! All you have to do is do not buy it. Let ME decide what I want to do for me. YOU have no business making MY decisions about my health, my life. While it's good this is getting coverage, I don't think you should gloss over the other chemicals in plastics which leech into our food. It isn't just BPA you have to worry about. Do what our grandmothers did out of necessity: learn to cook whole foods! It tastes better, is healthier and you know what you are eating. As for the expense argument, you wont be wasting 60.00 plus on one meal at a restaurant! They also canned their own foods. Hopefully it is still possible to buy cans without this poison in it. Home "canned" foods did not involve cans. It involved glass "Mason" or "Ball" brand, or other like-kind glass jars. However even THEY used lids with a coating of some kind on them to seal the deal. Freezing is the best way to preserve food and maintain the fresh taste. Fresh as always is best but not always possible. I like this article well written with references to a actual study and journal. In my mind a better writer than Jennifer Bixler – CNN Medical Executive Producer who lack sources and links to an actual study. In some study at some school in some city did this study and... you see my point you could pass the word to rest of the writer to do there job and post some sources.You cant believe everything you read on the internet with a a source. It comes down to money and time. I don't doubt that it is harmful – and we have known for many years that fresh and frozen food is so much better for us. Cooking fresh isn't terribly difficult, but it can be a pain having all fresh ingredients on hand without trips to the grocery every day. I guess the freezer will now become my BFF. Trust me!! Says the guy representing the canned food industry. LOL. Suspected of causing damage to human health? You mean just like, pure, distilled water if you consume too much of it? OH MY GOD WE'RE ALL GONNA DIE EVERYONE PANIC!!! Americans are fat because they eat fast food, drive everywhere, dont walk, and play video games instead of exercising. It's not because of the BPA. Check out the next blog () we talk about some of the retailers aardley going BPA-free. Trader Joe's is on the list. Their canned corn, canned beans, canned fish, canned poultry, and canned beef products are all BPA-free. You can see Whole Food's statement on BPA . 27% of their store brand cans are BPA-free, although they don't label which ones they are. We applaud the efforts of these companies and encourage them to pursue BPA-free packaging for the rest of their canned goods. We would also like for them to label the cans that are in fact BPA-free. "Tobacco does leave your system quickly and efficiently," says Rost. “Your body can handle it.” Another ignoramus talking out his rear rather than showing caution when it comes to peoples health. How would he have any clue as to what this substance might ultimately do to the human body? Urine contains 95% water. We must ban water from human consumption. MORONS! Urine expels the bad stuff. All studies show that all BPA is expelled. MORONS! Um, it all has to do with the concentrations that may be left behind and what the compound does on its way before it gets expelled. Besides, I severely doubt that ALL of it is getting expelled. Trace amounts left behind could be enough to do some damage. This has to be the lamest article I've read – what is it they are actually saying? Or is someone running for office? talk to an endocrinologist, this stuff is serious. It is responsible for for babies being born with hormones out of whack, and remember, anything that goes through your blood stream goes through your brain. They will take it off the market before they will tell you the truth about it. This is not true at all. Google blood brain barrier. Chemicals cannot enter the brain form the bloodstream unless they are actively transported or are lipophilic. To those that don't care about chemicals in your food, keep laping it up boys! The rest of us that care about our health, our children's health, and the future will keep calling the corrupt FDA and manufacturers out anytime we find this kind of stuff out! brakmaster on November 6, 2011 Oh well why not give it a shot, there's onihtng to lose, so I guess there's everything to win! And cmon who doesn't like sony products! I want them to ban this BPA immediately- I hate having to watch everything- I like soup, canned tomato sauce, etc.. I am pregnant, having a girl, and wish I had known this sooner. I eat canned food only about once a week, usually tomato sauce. Still, I am trying to eat healthy for me and my baby, and look what's lurking among the vitamins I'm trying to get from tomatoes. I love Campbell's chicken noodle soup!!! The good thing is I can cook my own!! I created my own chicken noodle soup recipe that will make you slap your momma!!! This article is misleading. It is not true that ALL canned products contain BPA. Eden Organics has been using BPA free cans for some of the products for over a decade. Technology is there, but costs 14% more per can. Ironically my CAT"s food is BPA free now (the cans) yet *I* cannot find food that is. pretty scary. This is really a big deal out of nothing. All this study has shown is how BPA is metabolized. If you ingest any chemical it will be metabolized and either excreted or stored. It doesnt indicate that any of the volunteers had negative health effects from their exposure to BPA. BPA is an estrogen antagonist that has been shown to have health effects in low levels in rodent studies. However, there are MANY chemicals that have been harmful to rodents but have no health effects in humans due to differences in metabolism and anatomy. No valid epidemiology studies exist showing deleterious effects in humans. While I would suggest limiting children and pregnant woman's exposure to canned food and BPA plastics until the science is more valid, I would not panic. For some reason, the media has really publicized this chemical and I believe government regulations are using this chemical in order to allow companies to make more money selling "BPA-free" items. Think about all the recent sales from people throwing out their old water bottles and replacing them with new "BPA-free" new ones. Also, it's a pertinent topic since 90% of Americans eat canned foods. Well, I'm 64 years old, and could use a little more hyperactivity, so I'm ramping up on canned soup! Who needs coffee, with this BPA stuff! Yum! Thanks for the hot tip (so to speak), CNN! So you mean to tell me that with all this modern technology that they can't make cans not contained BPA? Why is this just coming to light now after years and decades of eating anything out of cans? They can, just don't want higher production cost. Eden Organic is using non-BPA cans, but it costs them more to do so. It all boils down to penny-savings of big manufacturing companies. So I got BPA. What does that do for me CNN? Why write a story about something that may hurt (or not) me.when you have no idea scientificly of just what effect this chemical will have.